“Sydney-based artist Grace Kingston has created Here You Are, a study of the culture of Sydney’s inner west based on information collated from Facebook. If you could visualise your friends’ favourite hang-out spots in your area based on information collated from Facebook check-ins, what would it look like? 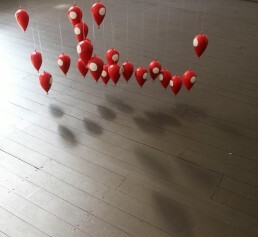 For artist Grace Kingston, it looks like a collection of plumb bobs or fishing sinkers suspended from the ceiling, swaying or twisting gently in the air currents. It looks like a series of selfies and a garish LED sign flashing on the wall. To collect the data, she enlisted the aid of programmer Nic Cope. He wrote a web-based script that pulled data from AppEngine, Python, Twitter Bootstrap and the Facebook Graph API, allowing Kingston to view every check-in ever made by her friends, hand counting to avoid duplicates and compiling it into a dataset. This was then used to create the drop-pin mobile. “The installation is geographically aligned with the area and based on a to-scale map of a 1 kilometre radius of the gallery, in which 1 centimetre equals 1 metre,” Kingston said. “The drop pins are positioned as to the number of check-ins at each location, where 1 centimetre equals one check-in; for example, Thai Riffic received seven check-ins so is positioned 7 centimetres from the floor. The three most popular locations — the Courthouse Hotel, the ZanziBar and the Town Hall Hotel — were chosen by Kingston as a backdrop for that most ubiquitous form of social media self-advertisement: the selfie. Meanwhile, a bright LED flashes status updates that accompany the check-ins, revealing a love of friends, beer and a good time; outside of the context of their social network setting, they seem like a stream of endless bird chatter, broadcasting the presence of someone, somewhere, doing something — seeking recognition, even though they may be surrounded by people they care about.